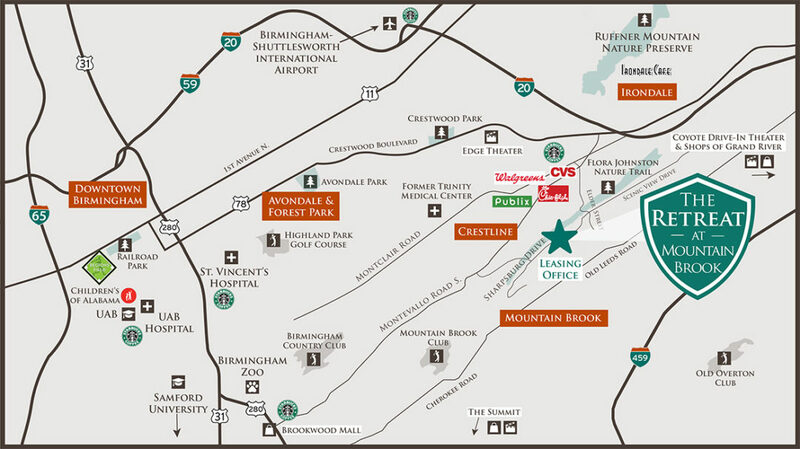 Location is everything, and The Retreat at Mountain Brook has all the conveniences you need within minutes from home. Located at 1600 Sharpsburg Circle, Birmingham Alabama, 35213, we are nestled against the community of Mountain Brook, just off of Montevallo Road. It’s a quick trip from the Retreat at Mountain Brook to trendy neighborhoods like Avondale, Crestline, Downtown, Forest Park and Southside. Here you will find an abundance of entertainment, restaurants and shopping. Visit any one of these neighborhoods, or spend the day at The Birmingham Zoo or Botanical Gardens, and you’ll be glad the trip home is just around the corner. World class medical care and education is close by on UAB’s campus and travel time to the Birmingham Shuttlesworth International Airport is about 15 minutes. The Retreat at Mountain Brook is close to both public and private schools. The schools are Grantswood (K-2), Irondale Community (3-5), Irondale Middle School (6-9), Shades Valley High School (10-12), and the Jefferson County International Baccalaureate School, located at Shades Valley High School. Nearby private schools include Highlands Day School, The Altamont School and St Francis Xavier Catholic School.